Pentecost Sunday 2014. We celebrate the coming of the Holy Spirit, as tongues of fire at the first Pentecost, and now, today in our lives and world. 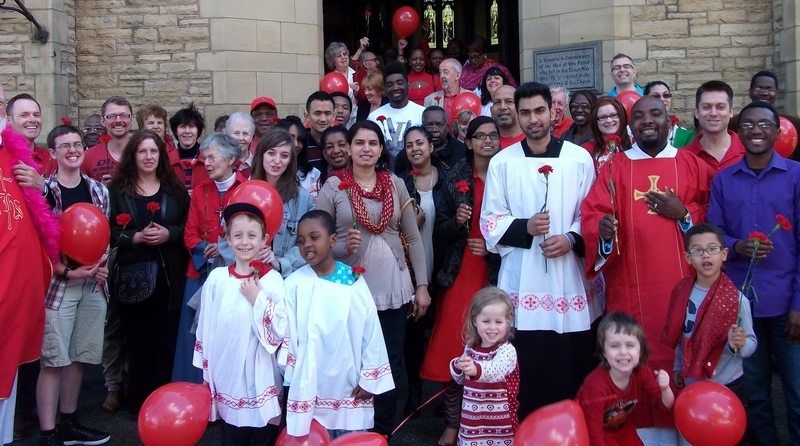 Here is our joyous congregation after High Mass, grouped on the church steps with carnations and red balloons. We take a congregation photo every year on Pentecost Sunday. Usually we gather on the lawn at the side of church but this year the grass has taken off heavenwards and the wet weather stopped us from cutting it in time! There’s not room for us all on the church steps so we are a bit squeezed, and parish assistant John who had the camera apologises for not managing to get everyone in shot – only Father John’s purple feather boa makes it into frame, and Churchwarden Desmond is nowhere to be seen – oh dear! However, the photo shows our variety and joy at St Chrysostom’s – don’t we look like a very varied and smiley bunch, full of the joy of the Spirit. This entry was posted in Anglican, Anglo Catholic, Christianity, Faith, Manchester, Pentecost, Spirituality, St John Chrysostom and tagged Anglican, Christianity, Manchester, St Chrysostom's, Victoria Park. Bookmark the permalink.